Courtney/Tiffany: We LOVE Alex Kingston! We are both crazy huge Doctor Who fans, and if there's a character we love almost as much as The Doctor, it's River Song. Of course this isn't the only reason that we are in love with the idea of Kingston as Coin. We've seen the duality of her acting solely through the show, and her resume speaks for itself as well. We aren't worried about her capabilities as an actor to handle Coin in the slightest. She would also be a perfect Coin candidate for the "lesser known actor" option. Savanna: I am a Doctor Who fanatic. And as such, I'd hate for my view of River Song to become tainted by seeing Alex Kingston play Alma Coin. However, setting my selfishness aside for a moment, I actually think that Kingston could potentially be a great choice. While her identity as a person is -- unfortunately -- closely linked to River for me and many others, Kingston is quite adept at slipping into her roles so well that you lose yourself in the character and the story. So with a different hairstyle and an American accent, I doubt Whovians would have trouble seeing Kingston as Coin and not River. I haven't seen ER, so I can't speak for her performance there, but Kingston was an absolutely phenomenal Mrs. Bennet in the miniseries Lost in Austen. While having nothing in common with Coin on the surface, if you're familiar with Pride and Prejudice, then you know just how manipulative and scheming Mrs. Bennet can be. True, she's simply a small-town meddler and not a political schemer, but after seeing Kingston so brilliantly portray this "ball-breaking" matriarch hell-bent on securing good marriages for her daughters, I would love to see her interpretation of Coin. Colleen: In my mind, Alma Coin is cold & manipulative, but she had to have some quality to make everyone trust her. I can easily see Alex Kingston taking on that role. She’s just so versatile. Most people probably know her as a doctor on ER or as the charming (yet not completely trustworthy at times) River Song on Doctor Who. When I saw Kingston’s name on the list of possibilities for Coin, I thought of her role as Boudica in Warrior Queen. She rallies her people to rebel against the Roman Empire and goes down fighting. She’s believable as a leader, and it’s this role I first thought of that made me think she would be a good choice for Coin. But it’s her Doctor Who role that clinched it for me. She plays River Song with an air of authority, but with her own secrets & agenda. She's all but mastered the 'I can be your best friend or you worst enemy' look, and, to me, that is the essence of Alma Coin. And I think the British accent would totally work for Coin. Kelsey: Being a massive "Whovian", I will forever and always see Alex Kingston as the lovable, sassy and adventurous Professor River Song. So upon first seeing her name among the list of actresses “Campaigning for Coin”, my initial reaction was to object. However, since I am a huge fan of Alex’s, she was worth looking into a bit more. That’s when I realized how amazing of an actress Kingston really is. Looking at her as Dr. Corday in ER, Mrs. Bennet in Lost in Austen all the way to Boudica in Warrior Queen and Dinah in Arrow. Every one of her characters is so different, yet Alex is able to bring them to life so vividly. That alone it is a huge testament to her ability. At this point, Kingston isn’t a household name - and that could definitely work in her favor. The fact that she isn’t incredibly well known could make her an easier choice for Lionsgate, considering their budget. But the fact that she is a very well rounded actress bodes well for the fans. I think she can easily bring Coin to life like she has with so many others! Rebekah: I'll be honest, I'm a long time fan of Alex Kingston, starting with her work on the long running, critically acclaimed, award winning, and fan loved NBC series ER. She'll always be the fish out of water Doctor Elizabeth Corday to me, which I think is a good way to think of Alex. Elizabeth allowed Alex as an actress to explore a multitude of feelings, and experiences to act out over the course of that characters 12 year run. 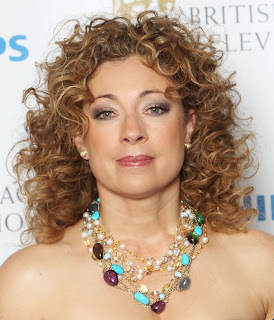 Aside from her work on ER though, Alex has played a gamut of other characters, most famously she's Doctor River Song on Doctor Who, where she's really kind of a source of comic relief seemingly majority of the time. And then there's her work on series' like Upstairs Downstairs, and the CW's Arrow. She's definitely proven her self capable of embodying different kinds of women, therefore I say I wouldn't kick up a fuss if she was cast as Coin. Her being cast might even bring in a whole slew of different kinds of audience members, because Alex is known from such a diverse collection of projects. She'd bring in the ER crowd, and the younger crowd from the Doctor Who side of things, and the PBS/BBC loving lot from being known for Upstairs Downstairs. Alex Kingston, I simply can't find fault with this idea. Who's next?